As we head into the winter season, we say goodbye to the leaves of the deciduous trees and shrubs. We bid a fond farewell to the last tattered remnants of low-growing favorites like the Pacific trillium (Trillium ovatum). If you think the forest plants are all going to sleep for the winter, you’d better not tell the licorice fern (Polypodium glycyrrhiza)! For this plant, the late fall and early winter rains are the signal that “happy days are here again!” Most (and remember, I said “most”) of the licorice fern at Tryon Creek State Natural Area is found growing on the mossy stems and stumps of trees, like the fern in the picture below. Red alder (Alnus rubra) and bigleaf maple (Acer macrophyllum) seem to be particularly favored host trees. 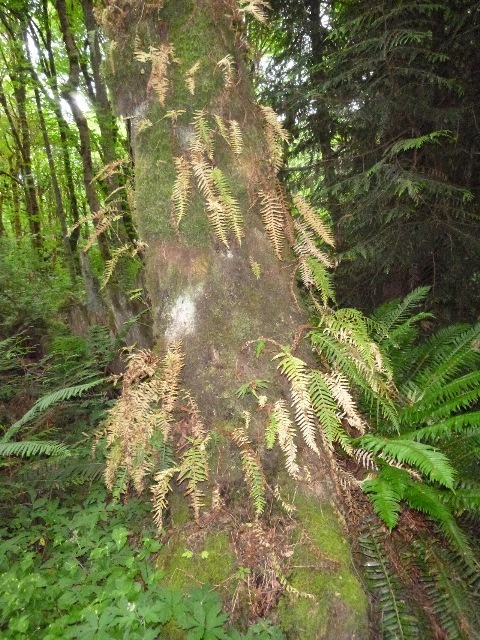 Some people have asked if the licorice fern is hurting the tree. In answer, I share my general rule for things in the forest: With the exception of some insects (which camouflage themselves by being green) anything that is green is making its own food, and if it’s not green, it’s not making its own food. The ferns are green, hence, they are making their own food. As for water, they are soaking it up from the moss in which they inevitably seem to grow. A final advantage of growing on the side of the tree is that it raises this relatively short plant above the brutal competition found on the forest floor. 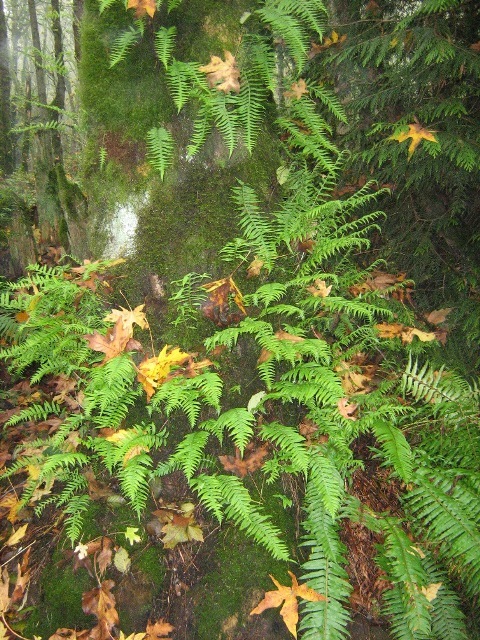 Further evidence of the fern’s independence from the tree comes from nearby George Rogers Park in Lake Oswego. At that park I have observed licorice fern growing in a moss-filled depression on a large rock. Clearly it isn’t getting any carbohydrate (like sugars) from the rock! Before we go any farther, it might be best to make sure you can distinguish licorice fern from another similar plant in Tryon Creek SNA, the sword fern (Polystichum munitum). 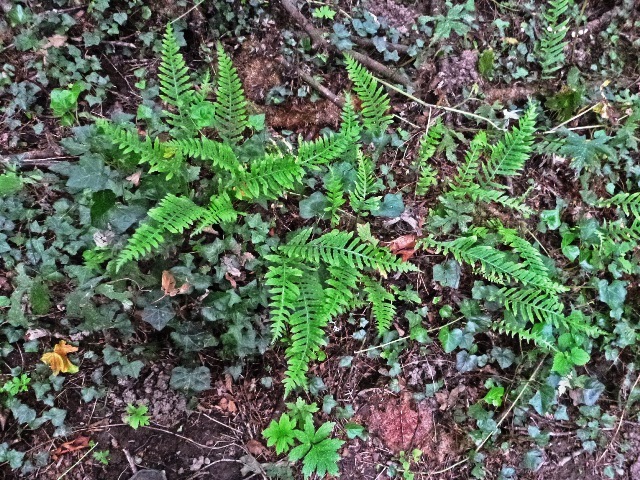 The sword fern commonly grows directly on the ground. The dead giveaway as to which is which is how the leaflet (technically a pinna) is attached to the midrib of the leaf. 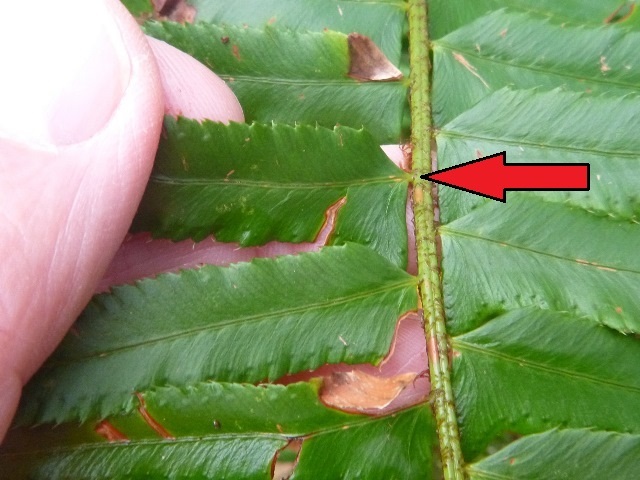 The sword fern leaflet is attached by a single thin structure (see red arrow in left hand picture below) to the midrib of the frond. 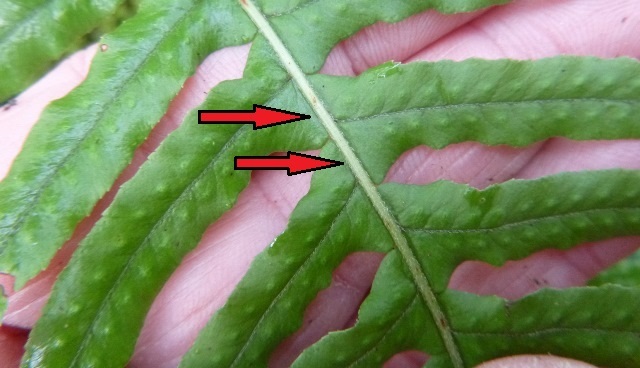 In contrast, the entire base of the licorice fern leaflet is attached to the midrib of the frond, as shown in the right-hand picture below. 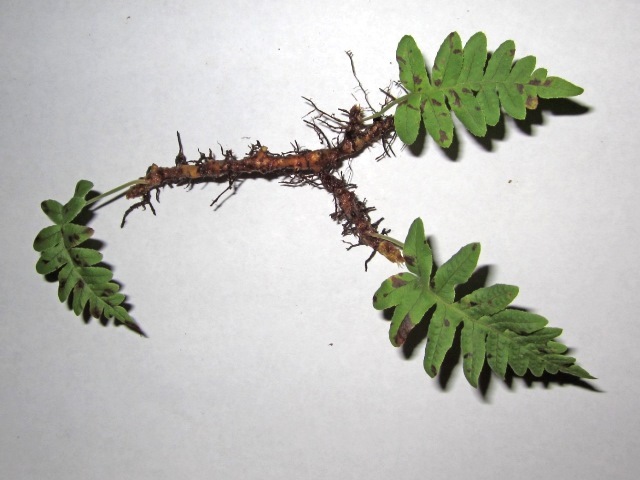 To better understand the licorice fern, we need to take a look at the whole plant, not just the part we can easily see. The three most important parts of the fern can be seen in the photo below. This piece of fern was in a large clump of moss that was blown out of a tree during a storm. The blue arrow points to a “frond” which is the green leafy part of the fern. The frond photosynthesizes, using light, water and carbon dioxide to make sugar to feed the plant. The fronds usually live less than a year. The red arrow points to the rhizome, which is essentially the stem of the plant. Like most stems, the rhizome lasts from year to year, and is responsible for producing both the buds that will grow into fronds, as well as the roots. The diameter of the rhizomes I’ve seen is about half that of a pencil. The green arrow points to a rhizoid, which functions just like a root. The rhizoids absorb the water and minerals the fern needs to grow. The rhizoids also anchor the ferns to the side of the tree. I have measured licorice fern rhizoids up to 30 cm (about 12 inches) long. 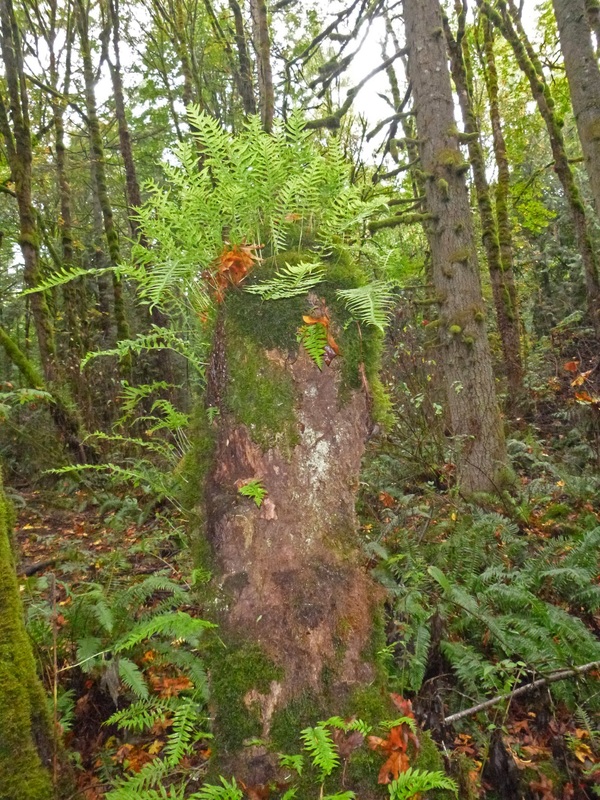 If you’ve ever gazed at licorice fern, you may have wondered how many plants are growing on the tree or stump. There may not be a simple answer. 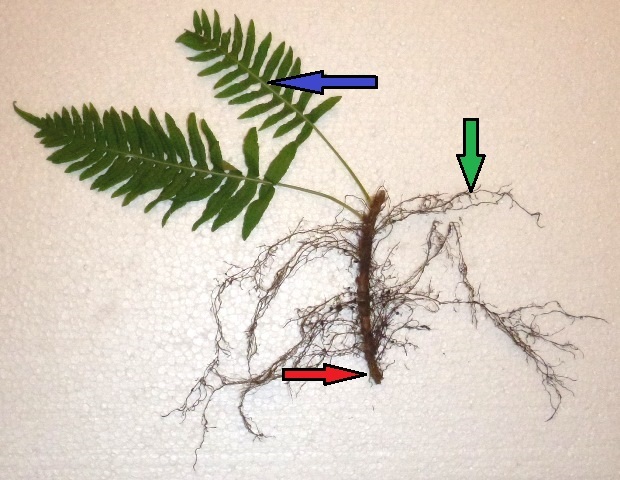 As the photo below shows, the rhizomes are capable of branching, and producing new fronds on each branch. Thus a single plant could spread out and cover a large area. 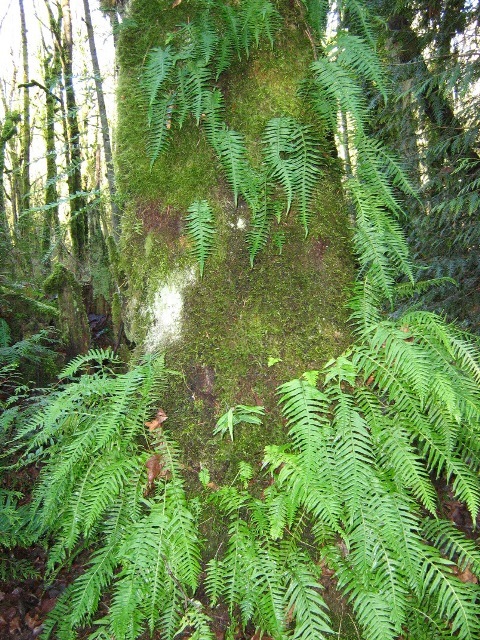 The moss plays a key role for most licorice fern. In the winter, the moss soaks up and holds the water that the fern needs to grow. And this is the secret to the fern’s being out of step with the rest of the forest. In the late spring, and early summer, as the temperatures rise, and the Oregon rains slack off, the moss dries out. When the moss dries out, the licorice fern loses both its water supply and its leaves. Then it “rests” for the duration of the summer. 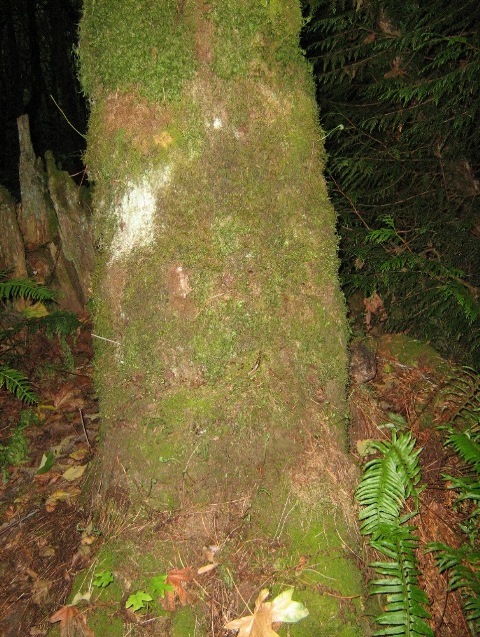 The following photos taken of a single tree along the Old Main trail are representative of the annual cycle of the typical licorice fern. The cycle starts with the tree sporting just one tiny licorice fern frond on October 1. The photos end the next year with the mature fronds dying off on June 1, after which it will remain bare throughout the summer. And so the annual cycle continues. If you’re watching carefully, you might see a small number of tiny licorice fern fronds emerging about late August. My observations over a couple of years suggest that most of these early young fronds represent a “false start” and that they quickly die while they are still quite small. While the typical licorice fern grows on the side of a tree or a stump, there are occasional clumps that appear to be growing on the ground. I’ve found that most of these clumps are ferns growing on a heavily moss-covered downed log which is in a very advanced state of decay. In some of these “ground dwelling” clumps, the fronds persist over the summer. For example, the cluster of fronds below are growing on an extremely rotten fallen log along the Red Fox trail. The picture was taken in mid-summer, when no tree-trunk-based fern bore green fronds. This observation leads to an important ecological principle, namely that plants don’t grow in spots which are the absolutely best environments, but rather in those environments which at least meet the plant’s minimum requirements, and in which the plant has the best competitive advantage. Thus most licorice ferns grow on the trunks of trees where the limited moisture causes them to lose all their fronds in the summer. This in spite of the fact that the fern fronds in the picture above are perfectly happy to hang on and grow all summer! Next time you’re walking in the woods, notice the different plants around the forest. Each species is different, and yet each one has survived for millennia. The licorice fern, which drops its leaves when many other plants are just putting theirs on, is a potent reminder of one of Mother Nature’s most consistent messages: There is more than one way to succeed. It’s true for plants, and people too. The licorice fern is reminding us that you too can be a success, even if you are marching to the beat of a different drummer!